A slightly odd one, this, or at least slightly unexpected. I keep various lists of possible books for the Read The World challenge, and City of Arches was on one of them as a book from St Vincent and the Grenadines. But while I must have known what sort of book it was when I made a note of the title, by the time I ordered it I was under the impression it was a childhood memoir. Perhaps because of the subtitle, Memories of an Island Capital. In fact it’s more like one of those local history books written by enthusiastic amateur historians. It’s based on a collection of newspaper articles about notable local buildings and their history. 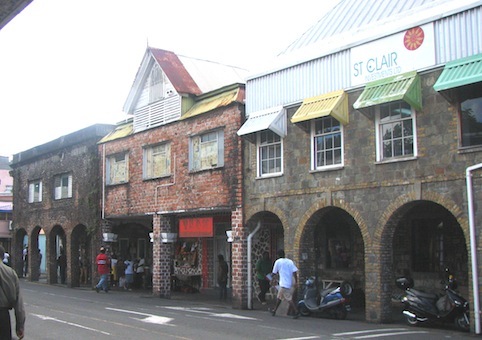 So I now know a lot more about the typical architecture of St Vincent: arched arcades and hooded sash windows are the most notable features, but also balconies and decorative fretwork and so on. This attractive house was built around 1926 in typical Kingstown style by Mrs. Jennings (née Rosalind Constantine) from Calliaqua, while her husband was absent, working with the railways in Nigeria. The builber was Jim Campbell. At that time it stood on its own extensive grounds with fruit trees, and pastures with cattle, sheep and fowl. The only house nearby was the estate house on top of the little hill where Mr John Hazell lived for many years. The house is of plastered stone construction, although the upper storey has has a wooden gallery partly closed in on the front an supported by arches below. The inside wall of the gallery is painted a beautiful shade of blue. Enclosed on two sides by the upstairs gallery the spacious living room walls are decorated with a hand painted, coloured design of blurred crossing diagonals, and old and unusual feature. Note the practical and graceful outside stone staircase, a feature often seen in the older suburban and rural homes. Mr Jennings retired in 1932 and the couple lived out their lives in this comfortable home, disturbed only when rioters in the 1930s hid the goods they had stolen from the stores of Kingstown among the bushes near their home. The house is now the residence of Mrs. Carol Saunders, Mrs. Jennings foster child. Her husband, Mr James Saunders was a clerk in a business and they had three sons. It’s a rather wonderful mixture of architectural description, completely mundane biography and just a few intriguing details that hint at the real emotional lives of the inhabitants: a husband away in Nigeria, rioters, a foster child. Since I have no connection to St Vincent and no particular interest in its architectural heritage, I found myself reading it like some kind of austere modernist novel: lots of fragmentary narratives that never quite resolve into anything more than the sum of its parts. » The photo of Back Street West is © Karl Eklund. It’s not the most flattering picture you’ll ever see of St. Vincent, but it does demonstrate the colonial style of architecture with arched arcades and hooded sash windows.